While earlier rumors have suggested that the Xiaomi Note 2 will be made official this month, it is now being said that the unveiling will happen sometime next month. The latest piece of information comes from popular analyst Pan Jiutang. 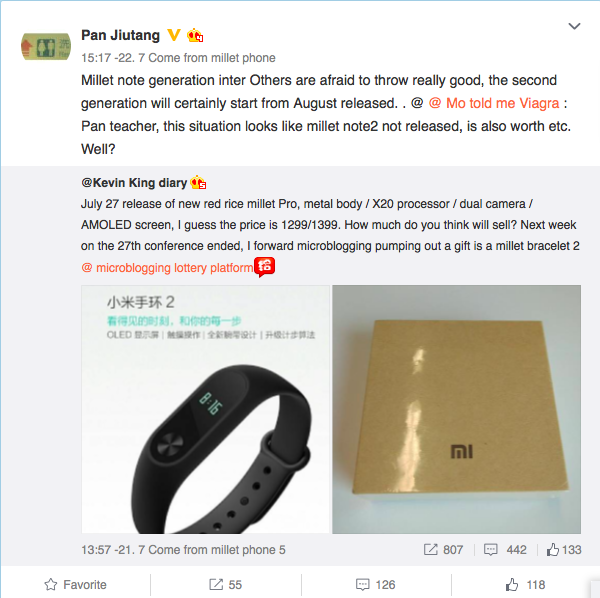 This is inline with the August time-frame already revealed by Xiaomi co-founder Liwan Jiang - Jiang basically said that some high-end products will be launched in the month of August. As for Note 2's specs, latest rumors say the device is powered by Snapdragon 821 chipset, and sport a 5.5-inch 1080p AMOLED touchscreen. RAM options include 4GB and 6GB, with 64GB and 128GB internal memory, respectively. In terms of camera, the handset features a 12MP rear unit. A large 3,700mAh battery is there to keep the lights on. There's also a fingerprint sensor on the front. what is expectation. im the one who share my idea all the time. what is USB 7.1 ?